All around the world and throughout history there have been symbols and traditions created that involve the use of food. Whether it's a religious ceremony, a local festival, a national holiday, a family tradition, food is often at the center of many occasions and traditions we keep. There are symbols of love, friendship, faith, and all of them have a history and a root. 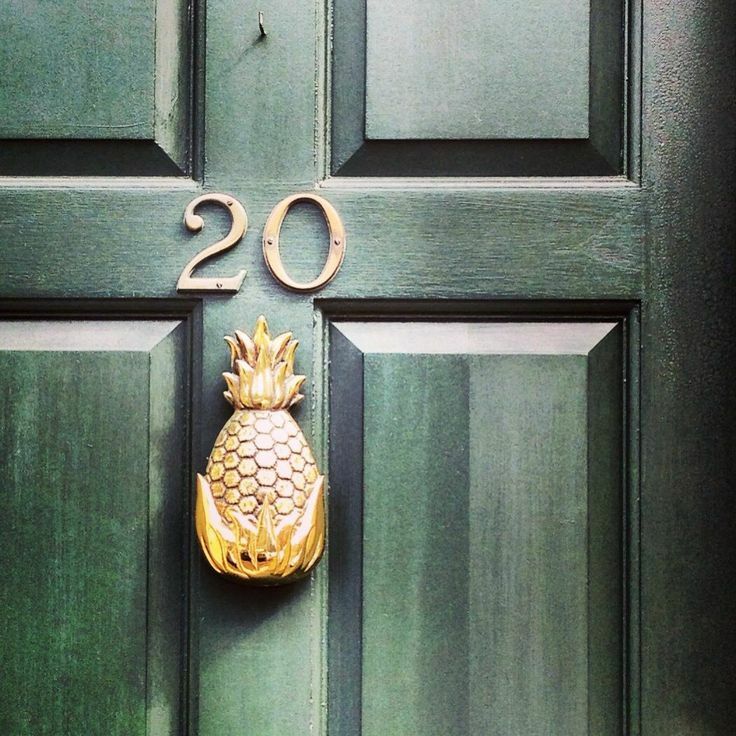 When visiting the east coast one may see pineapples adorning front door steps of homes as one of these curious traditions. Why would a pineapple be a decoration for the porch you might ask? It is a great symbol with a rich history. The pineapple is a symbol of hospitality. Many porches will have one as their door matt, or as a sculpture or doorknocker. 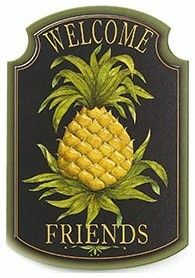 Having a pineapple at your door means you are a welcoming, hospitable, warm and friendly home. American colonists began importing the pineapple from the Caribbean in the 17th century. Due to its seemingly exotic qualities and rareness, the pineapple soon became a symbol of hospitality in early America. Because trade routes between America and Caribbean islands were often slow and perilous, it was considered a significant achievement for a host to procure a ripe pineapple for guests. Similarly, some accounts tell of New England sea captains who, upon returning from trade routes in the Caribbean or Pacific, would place a pineapple outside their homes as a symbol of a safe return. Due to its association with warmth and friendliness, pineapples in America were often used as the "crowning" piece in large displays of food. Similarly, the pineapple symbol was used frequently in the 18th and 19th centuries to decorate bed posts, tablecloths, napkins-anything associated with welcoming guests. Today, the pineapple remains a fitting symbol for the hospitality industry, and pineapple-themed products still abound. From lamps to candle holders to salt and peppershakers and beyond, the pineapple motif says "Welcome!" So, keep your eyes peeled for these little symbols in someone's home. It's surprising how many pineapples you might start to see! Along with adding a pineapple to your own doorstep, take one to someone else's! It is the best thing in the world to feel welcome when you've moved into a new home. It can be intimidating to start all fresh in a new home, neighborhood, community and especially when no one comes over to give a warm welcome. 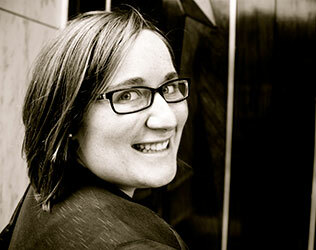 Don't wait to accidently bump into your new neighbor, take them something and say hello! Maybe add the pineapple tradition and symbol to your gift. 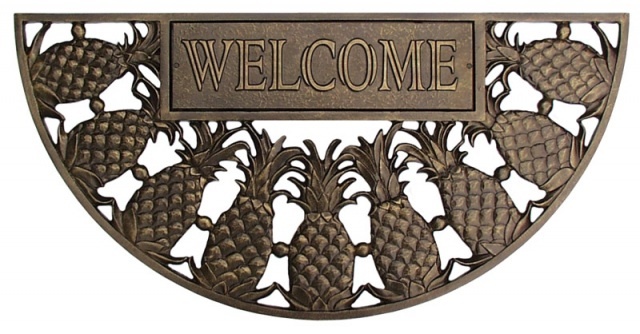 Your new neighbor is bound to feel welcome and loved with this amazing pineapple gift you take over to them! It's simple and yet stunning. Grab a Martinelli's Sparkling Cider, some round gold candies like Ferrero Rocher, some gold and green tissue paper and raffia tie. And wahlah!!! You've created a wonderful welcoming pineapple! Do you have other clever ways to welcome a new neighbor, or traditions of having a welcoming home? Share your thoughts in the comments below on how you've been welcomed or welcomed another. This world would be such a happier place if we thought of ways to help one another feel welcomed and loved. And a lot yummier to if we all gave each other pineapples. The pineapple is one symbol I would like to add to my doorstep for sure!